Today I got a late start I focused on the zebras in the background painting loosely and going for an out of focused hazy look, then I painted the male springbuck in the foreground with more detail to make it pop out in front leading the viewer back into the painting. Here is the first painting or color block in for the elephants. I will be painting them a little darker than the photo I’m using for reference. It is good to be back in the studio painting after a couple of very cold weeks. I’m working on a larger scale this time my canvas is 24” x 36”. 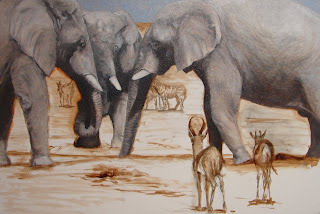 I started by drawing the elephants with charcoal and then using burnt umber thinned I painted the under painting you see here. For now I will not give a narrative as to the massage of this painting allowing the viewer to draw their own conclusion, but I will say this. Painting is a spiritual experience for me, sometimes more spiritual than others. Here I wanted a painting with a heart theme that would transmit a massage of love, and the only concept I had when I started was my hands forming a heart. As I started painting the thought of God’s ultimate love was overwhelming.